Quest Soya Lecithin is extracted from non-GM soya oil and is unbleached. Lecithin contains choline, a component of cell membanes. 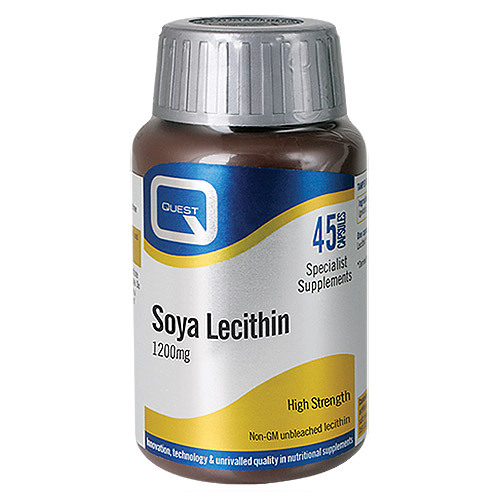 Why use Quest Soya Lecithin? Lecithin is a rich source of choline, a nutrient important for brain function and memory. Use to support healthy fat metabolism and help maintain optimal cognitive function. Non-GM unbleached Lecithin (from soya), Capsule Shell: Gelatin (from bovine), Glycerin). As a food supplement take one to three capsules daily with food. Swallow with water. Do not exceed the stated intake unless instructed by a qualified professional. Below are reviews of Quest Soya Lecithin - 45 x 1200mg Capsules by bodykind customers. If you have tried this product we'd love to hear what you think so please leave a review.